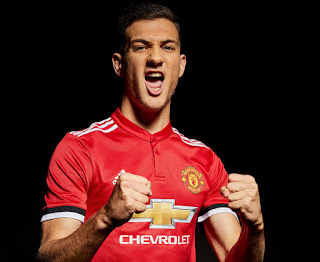 Manchester United new signing Diogo Dalot has revealed in an interview with MUTV that he is ready to give everything for the club. United announced the signing of Dalot from Porto on Wednesday after the 19-year-old sign a 5-year contract with the club. Though Dalot only played eight games for Porto last season, the young defender has set a goal for himself and has revealed he is ready to give all for his new club. In an interview with MUTV, Dalot revealed all and expresses his excitement on signing for Manchester United. The signing of Dalot will bring more competition for Antonio Valencia, Marcos Rojo, and Ashley Young as Dalot is capable of playing as a left-back and also as a right-back. We wish Diogo Dalot all the best and we hope he settles down quickly at Manchester United. Do you think Diogo Dalot is a good signing for Manchester United?